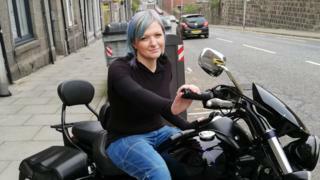 Becky, 30, from Aberdeen, featured in the 2017 Newsbeat and BBC Three documentary Diabulimia: The World's Most Dangerous Eating Disorder. Back then she revealed that because she wasn't taking enough insulin, the bones in her feet had disintegrated into what doctors described as "honeycomb and mush". A year on from the documentary, Becky tells Radio 1 Newsbeat "things have kind of picked up" for her. She no longer has to use crutches or see her mental health team and says she's excited for her future. "I'm engaged to be married, my partner's moved in and we've got ourselves a little dog. "She's my baby right now and that's helped a lot, pets do that, she gives great cuddles." The funding for research into diabulimia has been secured by clinician scientist Marietta Stadler, who works at King's College Hospital in London. "You can't have a bunch of doctors deciding on an intervention, you have to have the people who've lived with the condition involved," she says. The research is expected to take five years and the current plan is to come up with a 12 module treatment plan - a session every fortnight for six months - for patients with diabulimia. Becky says it's "about time because diabetes is overlooked" but she also has concerns. "Everybody's different and we all treat our diabulimia and diabetes completely differently to each other. So I suppose that's where it could be a sticky bit. "What can you do in 12 sessions with someone who has diabulimia? It's just scratching the surface - a fortnightly meet up - I just don't know if that's enough." The funding has been granted by the National Institute for Health Research (NIHR) - which decides to award money to research projects which it says have a "clear benefit to patients and the public". It told Newsbeat: "Everything we fund should have a worthwhile and real effect in the NHS and Marietta's research was a great example of this." "Closer working between diabetes and mental health care is just another part of the jigsaw - with more work planned as part of the long term for the NHS." Marietta says the research is just the "first step" and after five years of funding a bigger trial would be necessary before any formal treatment plan was adopted into the NHS. A Scottish Government spokesperson said: "Like everyone, people diagnosed with Type 1 diabetes don't just have physical health needs, they have mental health needs too. "Our ambitious 10-year Mental Health Strategy, backed by investment of £150 million over the next five years, sets out clearly how we can improve early intervention, and ensure better access to services, including specific actions to support people with eating disorders."